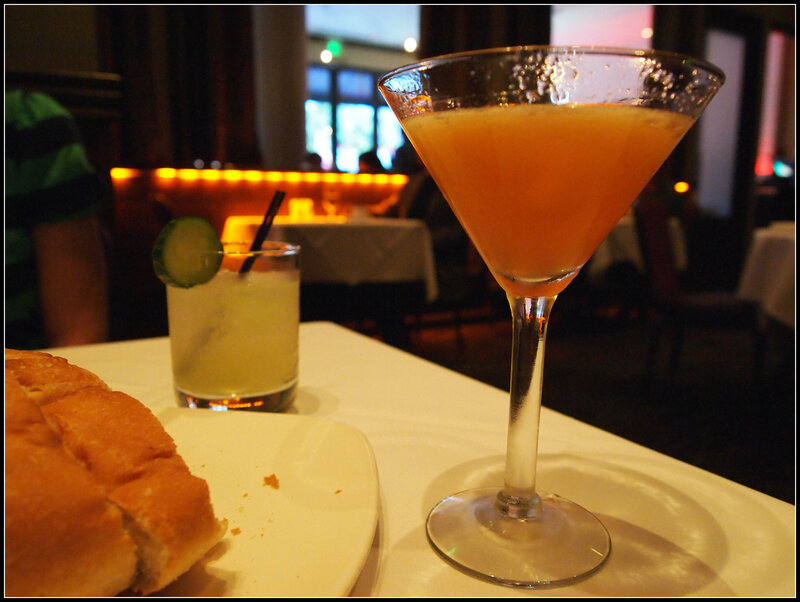 San Diego may be known for its laid-back attitude and casual dining, but there are still quite a few fancy-schmancy places to grab a good meal: whether you’re celebrating something special or just looking to get all dressed up for a night. Donovan’s Steakhouse is one of them. As a side note, the other reason Donovan’s sticks in my head as a special occasion place: When I first moved to San Diego, my best friend Cami (and her roommate) graciously let me sleep in their dining room (more like a nook, really). Later, when her roommate was looking for work, Cami helped him find and get a pretty nice job. As a thank you, I remember he took her out for a really nice meal – at Donovan’s! One more reason I like Donovan’s Steakhouse is that they serve their steaks with a potato and veggie, instead of serving the meat a la carte and then offering side dishes as an extra. It’s the little things that make me happy, I guess. What I recently learned is that Donovan’s has opened a new spot downtown (right next to their steakhouse): Donovan’s Prime Seafood! And said seafood joint recently unveiled a new oyster bar. When I was offered an opportunity to check out the oyster bar, I immediately invited Cami. Travis didn’t even get a cursory invitation. With a new baby at home, I figured Cami would appreciate a mini girls night out. More importantly, she enjoys a good oyster, which is more than I can say for Travis. Donovan’s Prime Seafood has dozens of varieties at the oyster bar, and Cami and I only tried 3 varieties: Luna oysters from Carlsbad, Hama Hama oysters from the Pacific NW, and Kushi oysters. All were delicious (as a good oyster should be), briny but not salty; sweet and silky. I could have eaten dozens, and I even saved the little dishes of mignonette and cocktail sauce in anticipation of ordering additional varieties of oysters. Spoiler alert: we were so full by the time the entrée rolled around I don’t know how I thought I could eat more oysters. Then we took part in an informal competition between the traditional hamachi tartare and the up-and-coming local sea bass ceviche: the tartare is served with layers of avocado, radish, and watercress; the ceviche is mixed with citrus segments, corn, and all these lovely curry-ish spices. Both were fabulous, but the ceviche won us over with the flavor twist. 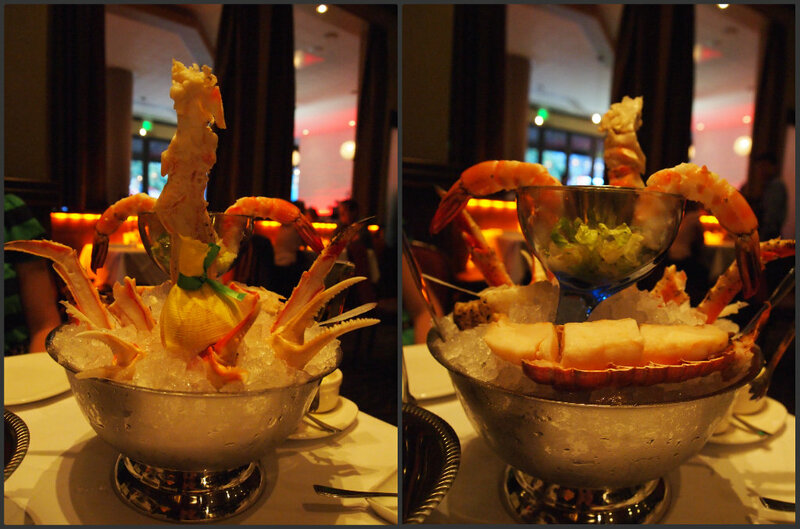 The half seafood tower was impressive and certainly towering over our table. All chilled on ice, split and cut so you didn’t have to exert any effort to get to the tasty bits, we had snow crab claws, king crab legs, jumbo shrimp, and Australian lobster tail. The jumbo shrimp (prawns?) were so huge but still tender – they had that crisp snap and bite, but weren’t chewy and tough. I know lobster is supposed to be every girl’s dream, but I will choose crab over lobster just about any day of the week. And the crab legs and claws in this tower did not disappoint at all. Cold, sweet, delicious, and easy to eat. We had all the requisite dipping sauces: cocktail, melted butter, and tartar sauce – the seafood in the tower was so perfect, I think you could eat the whole thing without ever needing to touch a sauce. 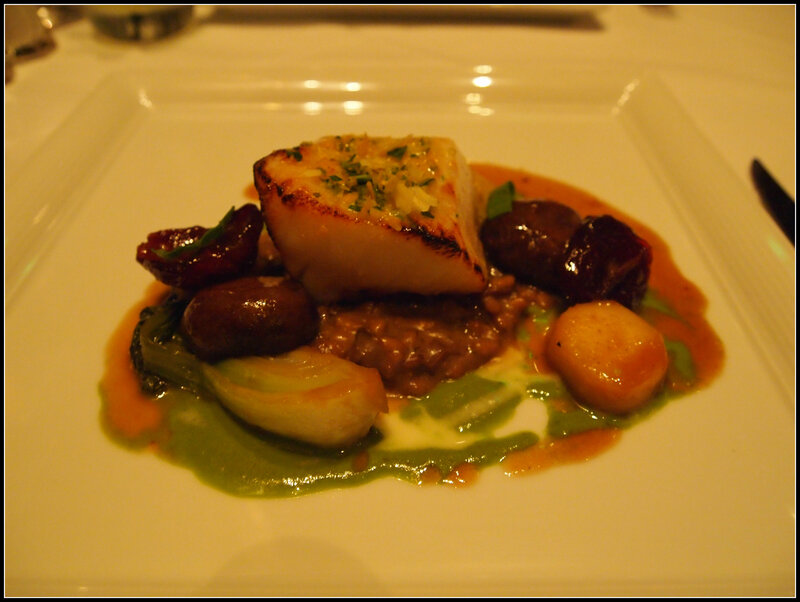 We split the sea bass entrée, predicting that we would not be able to finish a whole entrée each (so correct!) and our half portions were still beautifully arranged on the plate. We did actually wonder if sea bass was on the list of fish you’re supposed to avoid (and, yes, Chilean Sea Bass is) but I admit I didn’t really let that though slow me down too much. I’m in awe of chefs who can sear fish to a crisp on the edges while maintaining a moist, flaky interior, just as our tasty potentially-red-flagged sea bass was prepared. The fish sat on a bed of mushroom risotto (love risotto, mainly because I never make it at home) surrounded by bits of water chestnut, bok choy, mushrooms, and I think a prune. And then we moved on to dessert. 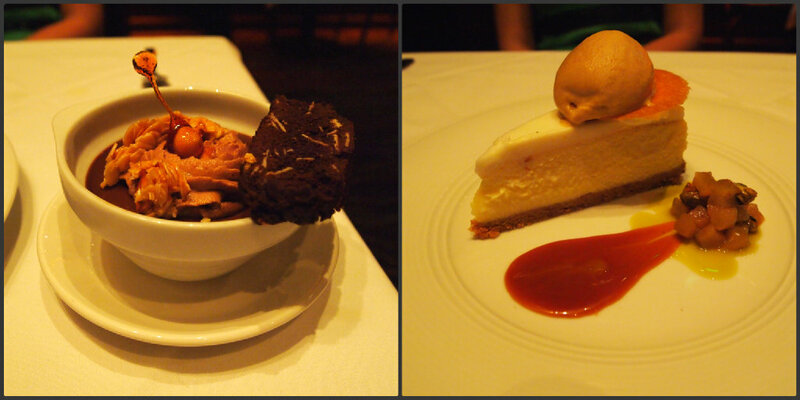 I consider it my duty as a blogger and a sweet-tooth fanatic to know where the good desserts are. Half the time, my decision on a restaurant is dependent on whether or not I want one of their desserts. Plus, I shirk a lot of “blogger responsibilities”, so identifying suitable sweets for you is the least I can do. All in all, we had an amazing evening at Donovan’s, who treated us like royalty. And I know they would treat you all like royalty, too, even though you may not be a social media maven like me! In all seriousness, it makes me happy to know that Donovan’s is still the quality (and, yes, pricey) restaurant I remember them to be. I’d be happy to visit either Prime Seafood or the steakhouse the next time I want to put on my fancy pants. Donovan’s Prime Seafood also holds a daily happy hour (4-6pm) with complimentary fish tacos and wraps. Many thanks to Donovan’s Prime Seafood and J Public Relations for setting us up with an amazing experience! This entry was posted in food, restaurants and tagged Donovan’s Prime Seafood, gaslamp, oysters, restaurants, san diego, seafood. Bookmark the permalink. That seafood tower is quite impressive! I feel the same way about lobster – I know lots of people ooh and ahh over it, but it’s not really my favorite of the seafood bunch. I also think it’s our “duty” to sample dessert, too. I mean, it’s all for research, right? So where would you go for pot de creme then? Inquiring minds want to know. That’s what I tell Travis – it’s my duty to tell people where good dessert is. I always try to know if a place has good dessert or if we’ll have to go somewhere else for a treat. These are important facts! I love the salted caramel pot de creme at Urban Solace and the chocolate budino at Cucina Urbana. The butterscotch pudding at Banker’s Hill is also a favorite. Ooh, and the chocolate mousse at Luc’s Bistro in Poway (it’s really rich and dense, but I love it). Your meal looks spectacular. I’ve always loved Donovan’s Steakhouse when in the mood for a Mad Men-esque atmosphere and something to satiate my carnivorous side.